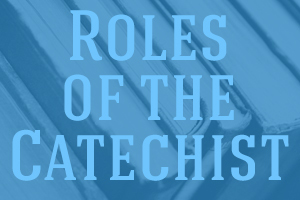 The Role of the Catechist invites catechists to explore four aspects of their ministry in greater depth: skills for telling the story of faith, ways to walk with learners on their faith journey as teacher companions, strategies for leading prayer, and the importance of being a witness for justice and of inviting learners to do the same. Tuesday June 3 and Thursday June 5 from 7:00 P.M.-9:30 P.M. Must attend both sessions to receive credit. This class is offered in English. It is no longer possible to register for this class, as it has started.